Brent graduated from Butler University in 2008 with a triple major in Biology, French, and History. While assigned to 2nd Intelligence Battalion at Camp Lejeune, NC, he served as a Section Leader, Plans Officer, and Company Executive Officer. 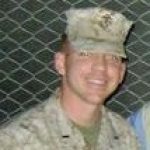 Following his stint in the Marine Corps, Brent continued his intelligence career as a Senior Consultant for L-3 National Security Solutions. He is a passionate traveler (of all seven continents) and basketball enthusiast. Brent will be pursuing his MBA at Harvard Business School as a member of the Class of 2019.